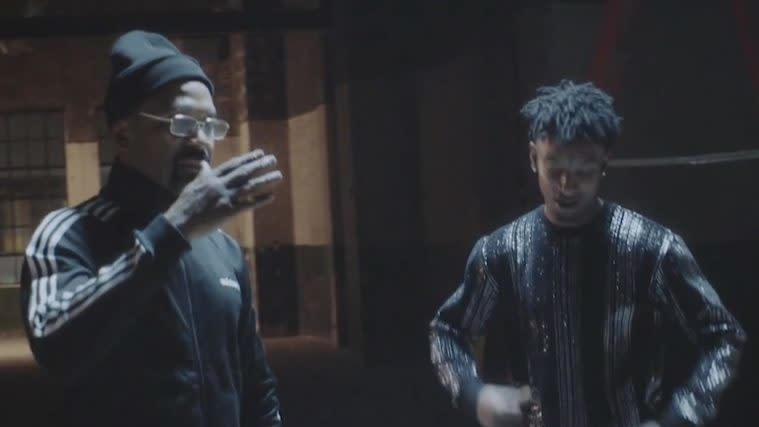 Mike Epps stars as an unwitting witness to what appears to be an attempted bank heist from 21 Savage and company. But all is not what it seems. For this black-and-white visual, Gucci and Abel deliver their performance from the middle of a dark alleyway, but as the camera pulls away, they begin to multiply. A$AP Ferg, "Trap and a Dream"
The lyricists flex among their crew and convertibles before sirens encourage them to pull off. Closing with a quote from French playwright Molière—"The greater the obstacle, the more glory in overcoming it"—the clip honors the #FreeMeek movement. Like a calm before the storm, G-Eazy slowly wanders a stunning architectural structure with models posing around him before the clip segues into a wild, sweaty, and debaucherous party.